This circuit is designed using descrete logic, to make up a dual-slope analog to digital converter. Dual-Slope ADCs are used mostly in digital voltmeters. They are relatively slow converters, but can filter out most noise. This is a 2-1/2 digit circuit, which is used to display the temperature in Fahrenheit degrees. Dual slope converters work by sampling the input for a fixed period of time. An integrator circuit, will accumulate the voltage over this period. This is the first slope. After that a reference level, will be applied in the opposite polarity. This generates the second slope. This slope will discharge the accumulated value, and the time it takes will be measured by way of a counter. The higher the accumulated value, the longer the count. By tweaking the frequency of the pulses counted, and/or the reference value, the count can be calibrated to represent voltage, or degrees of temperature. This particular circuit, is a demonstration circuit. A lot of short cuts have been made, that will effect accuracy. 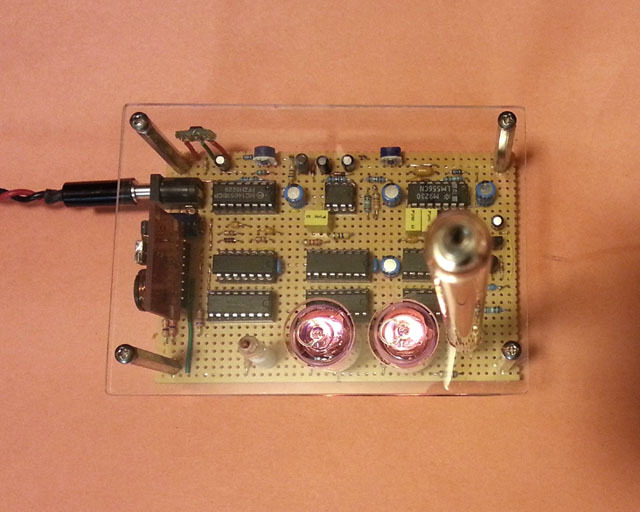 The accumulation timer, for the charge-up slope, here, is an analog one-shot, made from half a 556 dual timer. The period is set by a 1M 1% resistor, and a 2uf plastic film capacitor. The tempco of the film cap, is unknown, but is probably pretty poor. 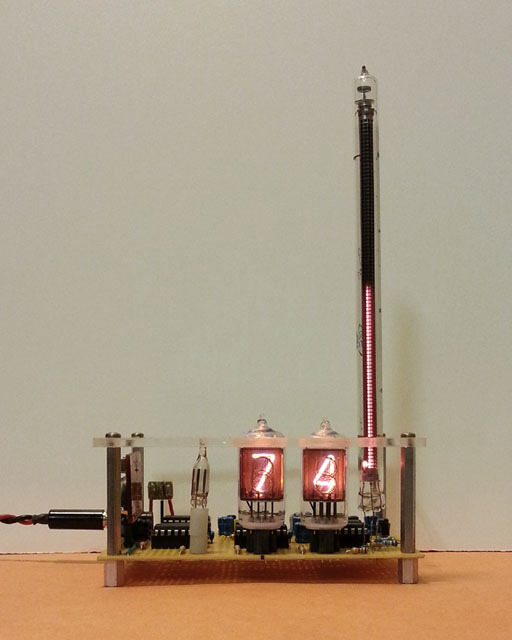 The count frequency of 64Hz, is also made by the other half of that 556 chip. The resistors, again, are 1% metal film, and the cap is an 0.1uf X7R ceramic. That’s the best tempco material for a cap, of this high of a value. In an improved circuit, both of these sub-circuits could be replaced by a crystal driven 4060 for the 64Hz, and 4520 8-bit counter, fed off the 4060, to work as the 2 second one-shot. That way, these timing values will be a function of a 32.768KHz xtal, which will always have better temperature stability, than a pair of RC circuits. The cap on the integrator, will remain as component of most concern. It will, most likely, remain a film cap. 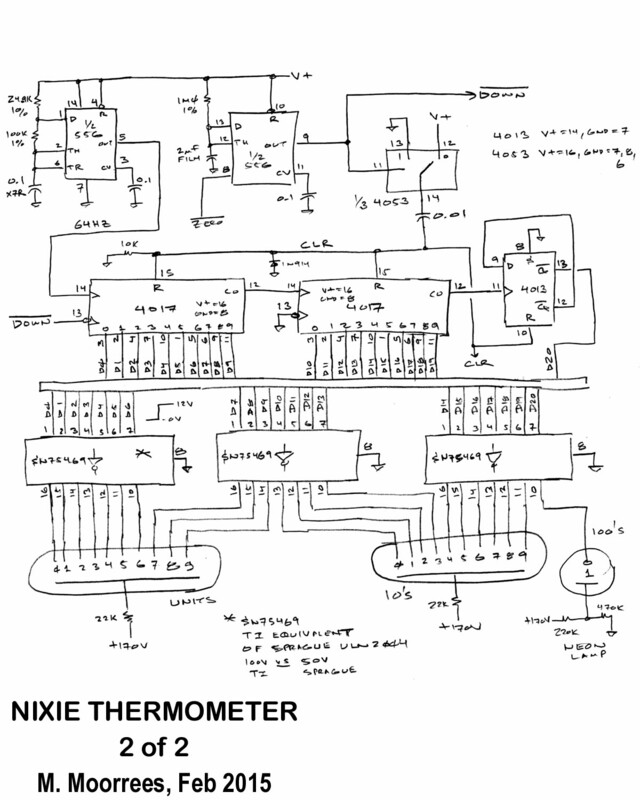 The source for the temperature input, is a LM34. It outputs 10mV per degree Fahrenheit. If the temp, is 75F, this chip will output 0.75V. 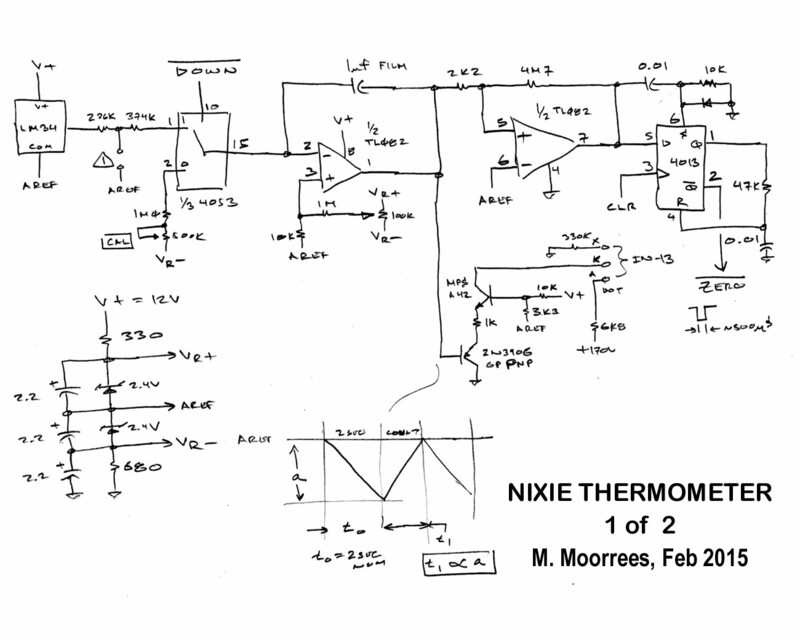 This circuit also drives an IN-13 neon bargraph. That bargraph represent the accumulated value of the integrator. The rising bargraph shows the charge slope, and the counters display the last value. Upon the end of the 2 second accumulation period, the counters are cleared, and discharge slope is started. The 64Hz pulses are counted until, the integrator is completely discharged, the a new sample is started, with the count stopped at its new value.